Greetings, future skater! I’m Cupcakes, and I’d like to tell you about the awesome experience I’ve had with Skate Charlotte, which is a weekly derby-style roller skating basics clinic that is taught by members of the Charlotte Roller Girls. 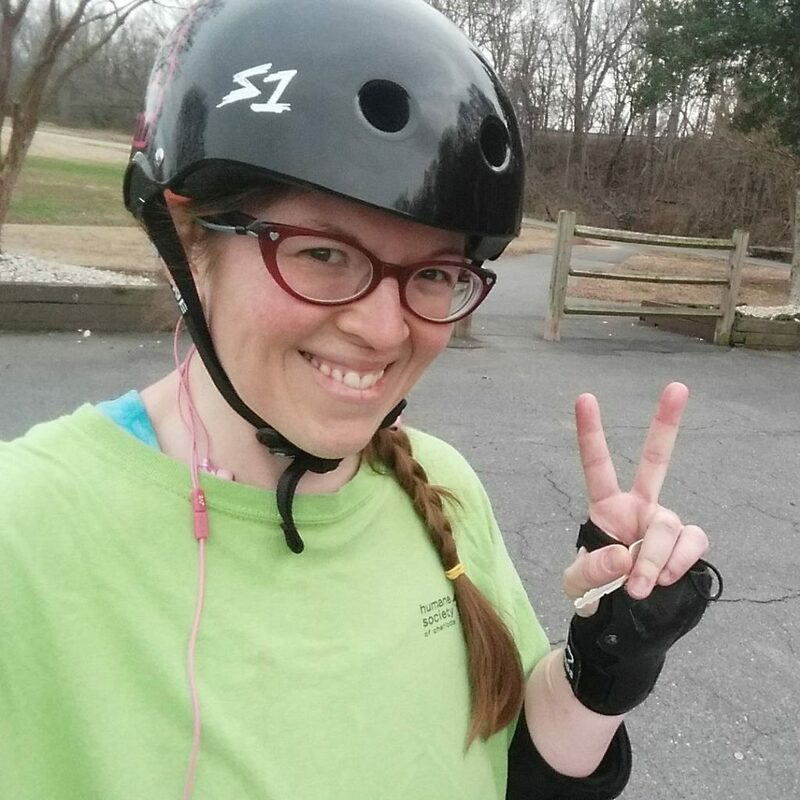 I attended my first Skate Charlotte session in early September 2016, after doing some very basic rink skating on my own for only a couple of weeks prior. My bestie somehow convinced me to come check out Skate Charlotte, even though I had no intention then of getting into roller derby. I’ll confess, I had no idea what to expect. I was pretty nervous that I would be the worst one there, and that everything they taught would be way above my skill level. Well…here’s what I found out. 1. You don’t have to know anything about skating to come to Skate Charlotte. Sure, it’s helpful if you’ve skated before – even if it hasn’t been since fourth grade – but it’s not imperative. 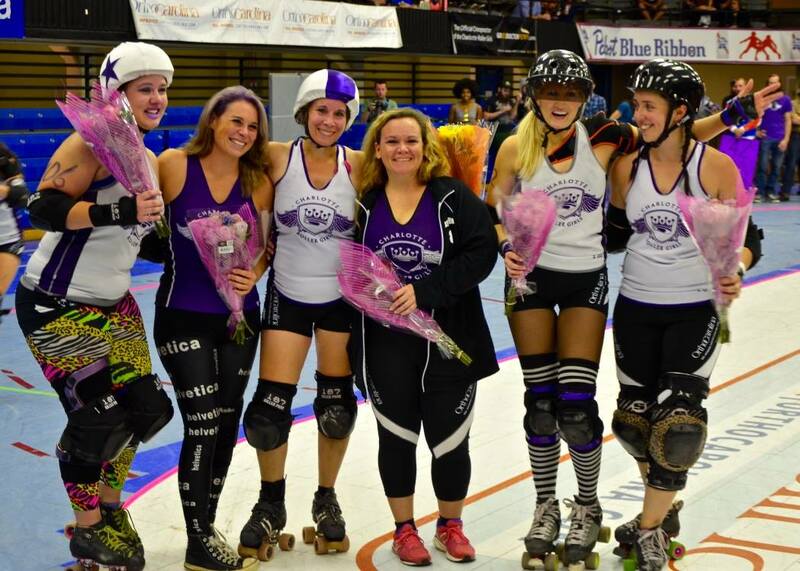 Skate Charlotte is there to meet you wherever you are and help make you better. If that means you come in like a knock-kneed baby deer on wheels, then welcome, Bambi! If you can already skate, great! Whatever skill level you have, Skate Charlotte is going to elevate it and work with you to get you to each next step. For some folks, the process will take longer than for others and that is 100% A-OK.
We live in a crazy busy world, and it can be hard to eke out much time and energy for workouts and training when you might be balancing school or work, dating or family life, friends, other social commitments, etc… I TOTES get it! Be aware that the more time you can dedicate toward practicing, the more likely that you’ll see personal gains happening at a faster pace. I have been super lucky to be able to work skating into my schedule several days a week outside of the Skate Charlotte sessions, so I was able to review skills we’d gone over there on my own, dedicating a lot more time to getting them down, and also to work on my speed and endurance on and off the rink. It showed in my progress from week to week, and it will show in yours, too, if you can put in the time. 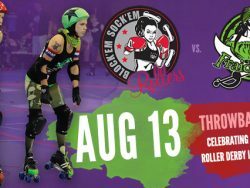 BUT – if the only chance you have to tear yourself away from all of your other obligations is for those few hours every Sunday morning at Skate Charlotte, that is still great! You will definitely progress and get better if you keep coming each week. Consistency is key, and if you make a point to show up each week and put in the time and the effort, it will pay off. Seriously. Don’t do it. You’re doing the best you can with what you got, and that is AWESOME. You’re not competing against anyone at Skate Charlotte except for who you were last week, and the week before. If someone else masters a skill before you do, who cares? It’s not a race. There’s no countdown clock. Keep on being the little engine that could and you will get there at the right time for YOU. 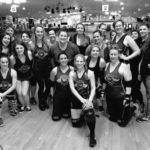 If your goal is ultimately to join the Charlotte Roller Girls, you will have to go through skill assessments. The sole purpose of passing assessments before participating in an actual game is to make sure that you are safe! To make sure you are not a danger to yourself or other players out on the track. It’s okay not to pass for a WHILE. Assessments are there to assess your current skill level in a number of areas. Look at each assessment as a learning opportunity to get a read on where you are, and what you need to spend more time and focus on improving. No one is ever going to be amazing at everything all at once, especially since we all learn at different rates and have different life circumstances. Assessments will help to illuminate both your weaknesses and your strengths. Take that knowledge and put it to work. 4. You might cry, and that’s okay. Guys. I cry while skating ALL. THE. TIME. I’ll get frustrated over a difficult drill that I can’t do properly, and find my eyes welling up. Or I’ll fall, repeatedly, and feel like I’m going to let my future teammates down foreverrrr, and can’t keep the tears from springing to my eyes. One particular time early in my attendance, during a crossover drill I ended up wiping out pretty spectacularly, painfully landing on a hip that I had already bruised multiple times over a short period of time. I just started sobbing. One of the coaches came over and asked if I was okay, and then if I was crying because it hurt or because I’d injured my pride. In truth, it was both! But here’s the thing: no one is ever going to give you grief for working through your feels, no matter why you feel them. 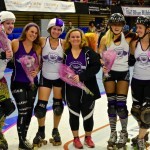 Truthfully, I embraced skating and derby during a time when my personal life was in massive upheaval, and found that since I was in a near constant state of feeling emotionally bruised, I was laying a lot of both sweat AND tears out on the track. While you may not be coming in to the sport with your emotions running quite that high, it is completely natural if you do find yourself experiencing strong feelings about your performance, and they all start streaming out of your eyeballs. I’d wager that everyone on the team has felt the same way at one point or another, and no one is going to judge you for it. Derby is hard. You will experience disappointment. But you will also achieve so much more than you ever thought! 5. Good equipment is important. 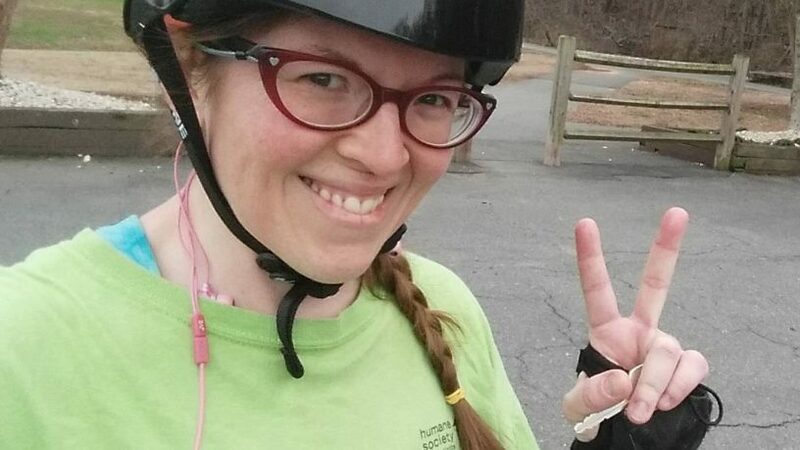 It’s okay if you don’t have all of the essential safety gear right away, because Skate Charlotte does have a limited amount of loaner pieces available (pro tip: get there early!). However, you will want to invest in your own pads sooner rather than later, and your body will thank you for making the quality choice. 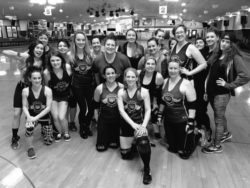 I started out with some lightweight pads that weren’t designed with derby in mind, and after every practice was left scratching my head as to why I seemed to be the only one experiencing excruciating pain after a standard run of double knee slides and six-point falls. When I upgraded to higher quality gear a month or two later, the difference was like night and day. Don’t be like me, friends! Buy the good stuff right out of the gate and you’ll save yourself a good chunk of money and joint pain in the long run. When choosing your equipment, it’s also really important that you try stuff on and get expert advice when possible. The gals on the team are going to be a tremendous resource for recommendations and opinions, but you won’t know what’s best for your body until you try on a few options. For this reason, I do not recommend ordering online. Just outside the Charlotte area, I’ve found the folks who run the pro shops at Kate’s Skating Rinks in Gastonia to be really knowledgeable, and to have a lot of different gear on hand to try out. Support your local skate shop, and they will take care of you! If you haven’t purchased skates yet, try as many brands and styles as possible. Talk to the employees about what the fit should ideally feel like (it will be tighter than you probably expect!). 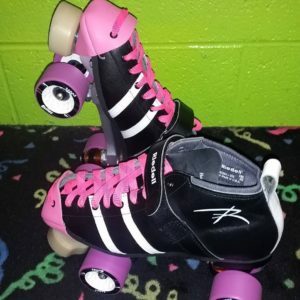 Try all of the skates, even the ones that might be a little outside of your “comfortable” budget. The initial expense for derby equipment can be kind of high, but if you invest in quality at the beginning, it will last you longer, fit you better, and ultimately be the best choice you can make for your performance and protection. 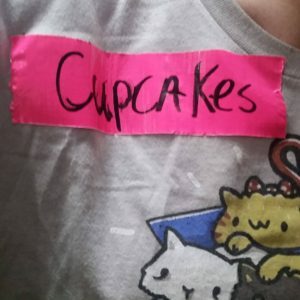 Newbie questions? Drop them in the comments!